For many people a trip to Disney World just isn’t complete without a character meal. 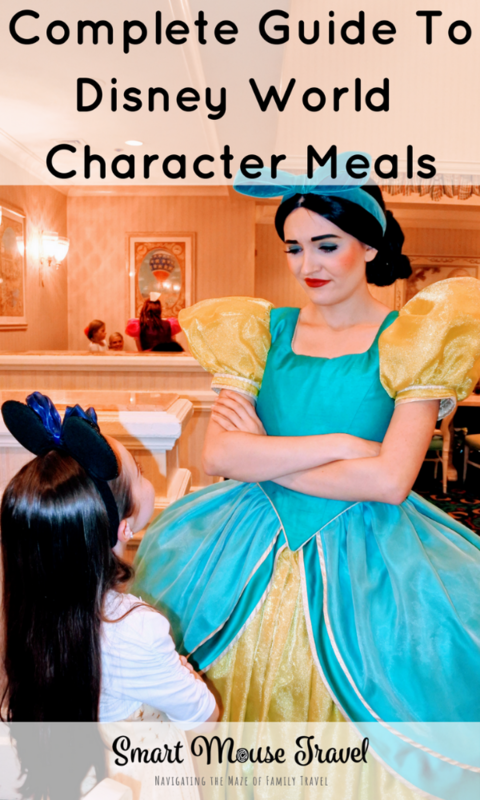 Did you know there are over a dozen Disney World character meal options? How do you decide which one is best for your family? With the help of several Disney planning experts I have compiled a complete list of Disney World character meals. Find out more about every single Disney World character dining experience to help you decide which meal is right for your family. 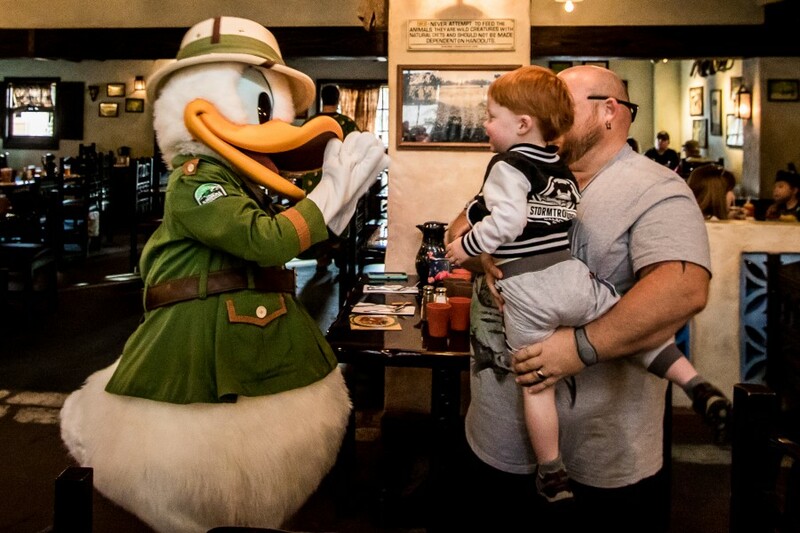 Tusker House Restaurant in Animal Kingdom is home to Donald’s Dining Safari. Here, Daisy, Donald, Goofy, and Mickey greet guests dressed in their finest safari attire. The characters rotate around the dining room greeting guests at each table. Cast members are on hand to assist with photographs. They will also provide an estimate of when each character will visit your table so you know when to go get food. Before the characters take a break, they invite kids to a dance party through the restaurant. Kids are also given noisemakers to shake along to the beat. The characters are very attentive and spend plenty of time at each table. Characters appear at all mealtimes, but the lineup may vary. The food is served buffet style and features delicacies influenced by East Africa. However, there are plenty of options for kids and other picky eaters. The food is served in a central “marketplace” flanked on each side by dining rooms. At lunch and dinner, alcoholic beverages can be purchased for an additional fee. The food quality was excellent at breakfast. There was a wide assortment of traditional breakfast foods as well as specialty dishes. The food was refreshed frequently and never ran out. The wait staff was also very attentive with drink orders. Reservations at Tusker House start at 8am. If you’re able to snag one of these coveted reservations, you can finish your meal and get in line for nearby Kilimanjaro Safaris before the park opens to other guests. There is also a Rivers of Light dining package that includes a meal at Tusker House and premium seating for the Rivers of Light show. This is available for all mealtimes and is booked separately from regular dining. Once you finish your meal, you’re given a voucher for a preferred seating location near Dinoland USA. Find a full review of the Tusker House meal here. Advanced Dining Reservation Recommended: Yes. This is one of the few restaurants at Disney World that offers breakfast reservations before the park opens so try to book early morning reservations right when the window opens (180 days in advance). Characters: Daisy, Donald, Goofy, and Mickey. Location: Tusker House is located in the Africa section of Animal Kingdom right across the bridge from Discovery Island. Do you have a princess fan in your group? Then Akershus should be on your list of character meals to reserve. Belle welcomes you as you first enter the restaurant. She signs autographs and takes pictures with your group before you are seated. There is a PhotoPass photographer with Belle so this is a great opportunity to get your whole family in the picture. Once you are seated you may start your meal with an appetizer buffet. Your main course is a plated meal of your choice brought to the table. Dessert is served family style and usually includes 3 sweet treat options. Several princesses visit your table throughout the meal. We saw Cinderella, Snow White, Sleeping Beauty, and Rapunzel (in addition to Belle who welcomed us to dinner). 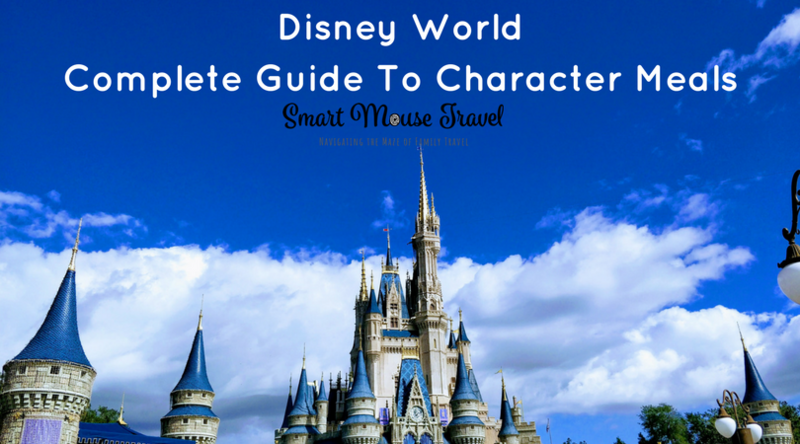 Please note that exact characters can vary; the Disney World website lists Cinderella, Snow White, Belle, Sleeping Beauty, and Ariel as the princesses you are most likely to encounter. During your meal your own prince or princess is invited to join the Princess Processional where they can parade around the restaurant with one of the available princesses. I think Akershus Royal Banquet Hall is a great choice if you want to meet several princesses during a character meal. The lighting is a bit dim for photos, but the character interactions were really sweet. My niece was completely enthralled when meeting the princesses. The princesses also did a good job of interacting with both girls in our group. Find a full review of Akershus Royal Banquet Hall here. Advanced Dining Reservation Recommended: Yes. Akershus Royal Banquet Hall is a very popular dining reservation so book 180 days in advance (when your dining reservation window opens). Characters: We saw Belle, Snow White, Sleeping Beauty (Aurora), Rapunzel, and Cinderella, but exact characters can vary. In fact, Ariel is listed on the Disney website, but we saw Rapunzel instead during our meal. Location: Akershus Royal Banquet Hall is found in the Norway Pavilion of Epcot’s World Showcase. Garden Grill has Chip ‘N’ Dale’s Harvest Feast meal. This character meal occurs at breakfast, lunch and dinner daily. The Garden Grill restaurant is located in the Land Pavilion at Epcot. The restaurant overlooks the Living With The Land attraction. At Chip ‘N’ Dale’s Harvest Feast you generally see Chip, Dale, Mickey Mouse, and Pluto. Please note that characters are always subject to change. We thought that our interaction with each of the characters was very good. In fact, this was the most fun Mickey we have met at a meal. Each character spent a few minutes with us and didn’t rush off to the next table. The meal is served family style with large platters of food. For those with food allergies (other than those on the standard Disney World allergy menu) the ability to accommodate a food allergy is limited compared to our experiences at other character meals. The staff was very helpful and we were able to find some items that were safe for Elizabeth, but it was more of a challenge. Garden Grill’s Chip ‘N’ Dale’s Harvest Feast is a fun character meal option for those who are big Chip and Dale fans or those who want a chance to meet Mickey and Pluto, but aren’t able to get a reservation at Chef Mickey’s. Find a full review of Chip ‘N’ Dale’s Harvest Feast here. Advanced Dining Reservation Recommended: Yes. Characters: Chip, Dale, Pluto, and Mickey Mouse are usually in attendance, but exact characters can vary. Location: Garden Grill is inside The Land pavilion in Epcot, in the same building that holds Soarin’. Hollywood and Vine is a buffet/family style restaurant that serves American cuisine. When you walk in, you are transported into a cafe from the early 1900s with a Hollywood feel. 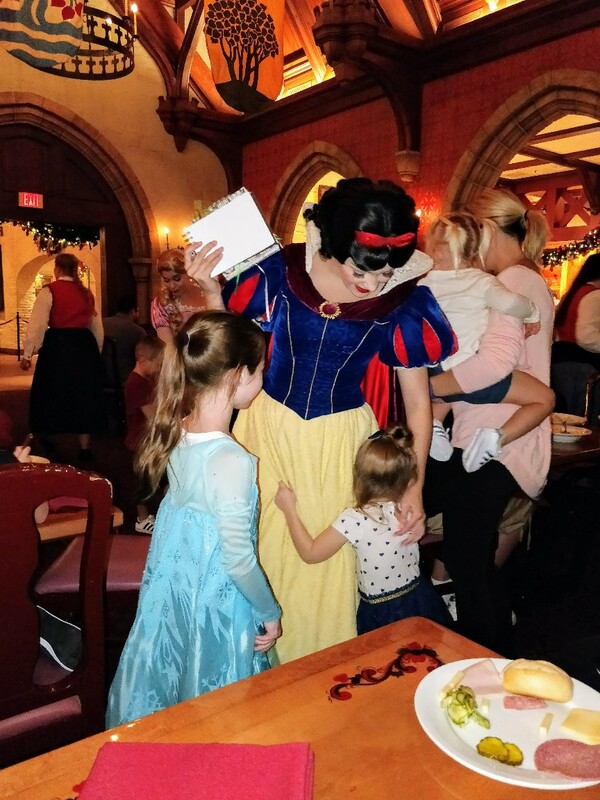 While you are enjoying your meal, characters will come to your table to meet with the family, sign autographs, and take pictures. Keep in mind that there are no PhotoPass photographers with the characters so have your cameras nearby. Hollywood and Vine features two different character dining experiences, Disney Junior Play ‘n’ Dine (breakfast) and Minnie’s Seasonal Dining (lunch and dinner). During the Disney Junior Play ‘n’ Dine, there are some short shows with the characters. In the shows, they invite the children to come up and participate in the dancing. If you have a child who loves the Disney Junior Channel, this is the character meal to take them to. Since it is a buffet, it’s all you can eat of a wide variety of foods and is great for picky eaters, both young and old. Hollywood and Vine also participates in the Fantasmic! Dinner Package. Have dinner with Minnie and friends and then get VIP seating for Hollywood Studios’ nighttime show Fantasmic!. Find a full review of the Hollywood and Vine meal here. 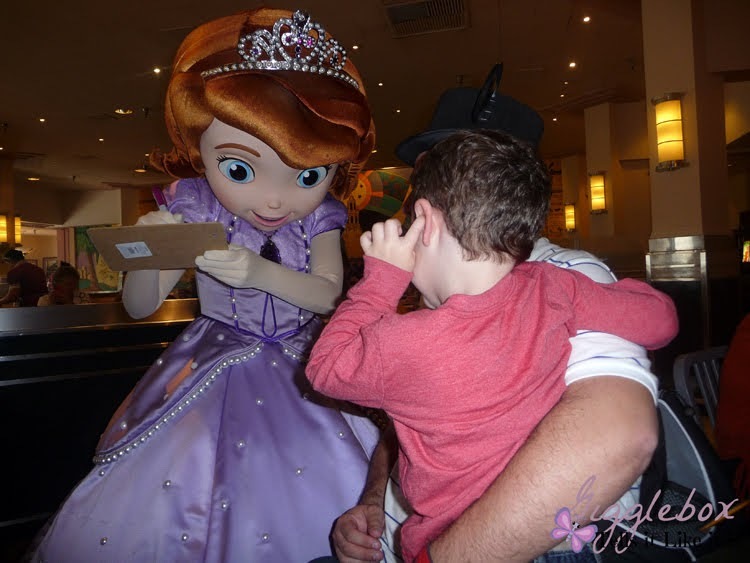 Characters: Disney Junior Play ‘n’ Dine – Sofia the First, Doc McStuffins, Jake from Jake and the Neverland Pirates, and Handy Manny. These characters are subject to change at anytime. Location: Hollywood and Vine is located at Echo Lake in Disney’s Hollywood Studios. Cinderella’s Royal Table is likely tied with Chef Mickey’s as the most sought after Disney World character dining experience. I think the combination of eating inside Cinderella’s castle and meeting (usually) five princesses make people clamor for this reservation. When you enter the castle you will wait in a small line to meet Cinderella. She has a lovely backdrop for photos, and there is a PhotoPass photographer available to take your picture. After meeting Cinderella you climb a spiral staircase lined with stained glass windows to reach the restaurant. There is also a small elevator for those with mobility concerns. Your child will be given two small gifts when you are seated: a wishing star for each child and a wand for girls or a sword for boys. These gifts are used during a wishing ceremony during your meal. Lunch and dinner are three-course meals with a choice of appetizer, main course, and dessert. At different times during your meal there is a royal announcement where each visiting princess is introduced to the dining room. After this introduction the princess greets guests by making her way around the dining room. We have generally seen Cinderella, Ariel, Snow White, Jasmine, and Sleeping Beauty at Cinderella’s Royal Table although exact characters are subject to change. Cinderella’s Royal Table has always been a favorite meal of ours, because we love the ambiance of the dining room of Cinderella’s castle. We have also always had quality princess interactions at this meal, too. The main drawback of Cinderella’s Royal Table is the price. It uses two table service credits for a meal or requires pre-payment in full at the time of booking. 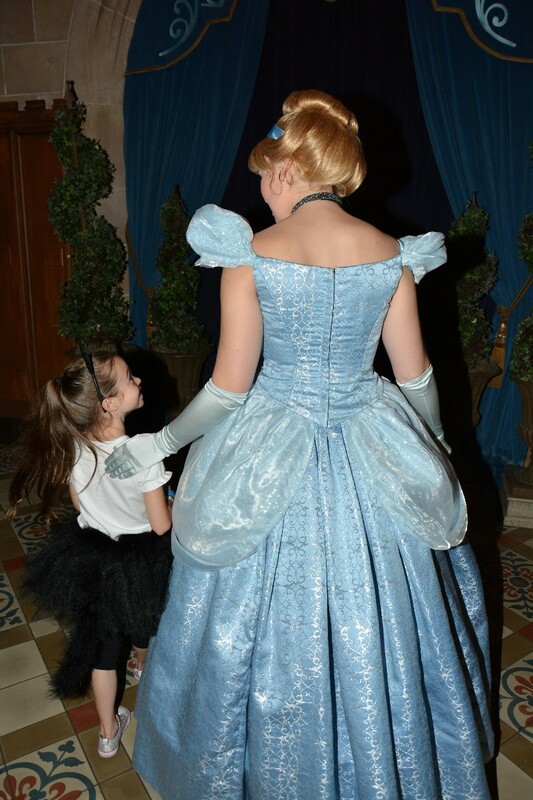 Find a video review of Cinderella’s Royal Table by Being Mommy With Style here. Advanced Dining Reservation Recommended: Yes. Cinderella’s Royal Table is one of the most popular dining reservations in all of Disney World so book 180 days in advance when your dining reservation window opens. Characters: Cinderella, Snow White, Ariel, Jasmine, and Sleeping Beauty (Aurora) are usually in attendance, but exact characters can vary. Location: Cinderella’s Royal Table is inside the iconic Cinderella’s Castle at Magic Kingdom. The entrance to the restaurant is in the back of the castle across from Bibbidi Bobbidi Boutique. This is a fun location but was one of the longest waits (other than ‘Ohana) to get in for a character breakfast. That being said, the food was delicious and the French Toast served here at breakfast is one of my husband’s favorites! They have a great variety of typical breakfast food, and a number of more southern favorites. Park admission to Magic Kingdom is required to eat at this restaurant. Location: Crystal Palace is situated in the heart of Magic Kingdom with gorgeous views of Cinderella Castle. The bright windows allow for lots of natural light in the restaurant, which make for great pictures with the characters. Disney’s Beach Club Resort has a fun character breakfast each morning featuring Minnie Mouse. At Cape May Cafe breakfast you usually meet Minnie Mouse, Goofy, and Donald Duck in cute beach attire while you dine. The characters make their way to each table during your meal. When the character comes to the table you can goof around with the character, take pictures, and have autograph books signed. Minnie, Goofy, and Donald were all very interactive and fun during our breakfast. Minnie even noticed our red and white polka dot nails and loved our Minnie-inspired manicures. The breakfast buffet was large and offered a lot of choices from breakfast meats, eggs, various toasts and pastries, to the iconic Mickey waffle. The chef at Cape May Cafe did an excellent job accommodating Elizabeth’s food allergy, and she ate a ridiculous amount of breakfast. We thought the Cape May Cafe breakfast with Minnie and friends was a great way to finish our trip. If you are staying at the Beach Club, Yacht Club, or Boardwalk Hotel this breakfast is within walking distance and is a fun way to start your day. If you are staying elsewhere it can still be a good choice for your Epcot park day. Cape May Cafe is only a few minutes walk to Epcot’s International Gateway entrance. For us it was a final activity before heading to the airport so that we got to do something on our travel day home. Find a full review of the Cape May Cafe breakfast here. Characters: Minnie Mouse, Donald Duck, and Goofy are usually in attendance, but exact characters can vary. Location: Cape May Cafe is just past the lobby of Disney’s Beach Club Resort. The Bon Voyage character breakfast at Disney’s Boardwalk Resort is the newest character dining experience to be offered at Walt Disney World, and they recently extended the hours to 12pm to accommodate even more guests. 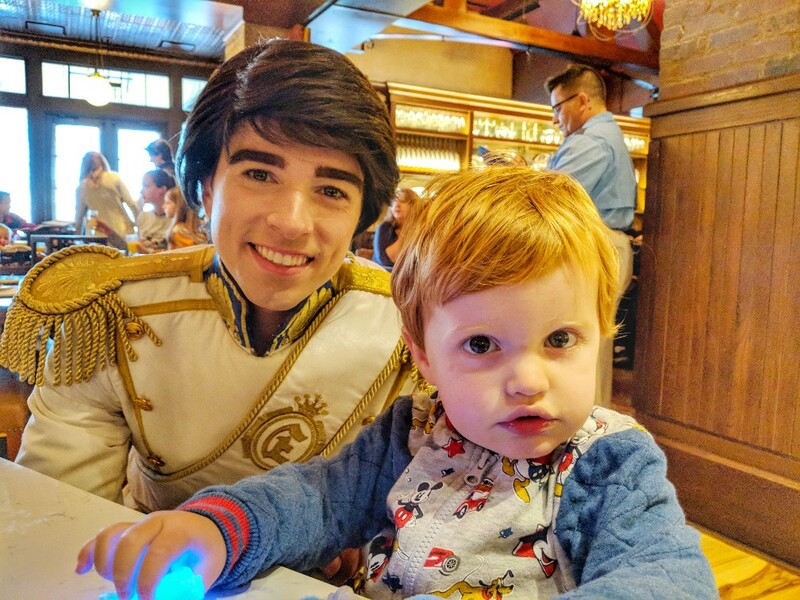 Trattoria al Forno is a beautiful dining location, and this is a great opportunity to meet some of the harder to find characters, particularly Flynn Ryder and Prince Eric. My favorite thing about the experience is that it isn’t a buffet, so there’s no chance you’ll get up to go and get food and end up missing a character stopping by. Instead, your meal begins with a pastry and fruit assortment, and then you order an entree off the menu that is then brought to you. There are your usual pancake and waffle options, as well as something for more adventurous eaters on both the adult and kids menus, and kids under three eat for free. You are able to request more food at any time (so don’t be worried that you might leave hungry!) and any extras can be boxed up and taken away for later. This is a nice and relaxing place to have breakfast and meet some rare characters without the usual chaos that comes with a character dining experience. Find a full review of the Bon Voyage breakfast here. Advanced Dining Reservations Recommended: Yes. Characters: Rapunzel, Flynn Ryder, Prince Eric and Ariel. These characters are there the majority of the time, but I have heard of Merida being there in replacement of another character on occasion. Location: The breakfast is held at Trattoria al Forno at Disney’s Boardwalk Resort. We love the character meal at Chef Mickey’s restaurant. I mean what could be more iconic than eating a meal with the Fab 5 – Mickey Mouse, Minnie Mouse, Pluto, Donald Duck, and Goofy! Chef Mickey’s is a buffet restaurant. Breakfast is from 7am until 11:15am, then brunch from 11:30-2:30 and finally a dinner buffet from 5pm until 9:30pm. We have dined for brunch and breakfast at Chef Mickey’s. The brunch is served everyday, and is a hybrid of breakfast and lunch offerings. Once seated, you can help yourself to the extensive buffet, which includes the famous Mickey waffles (breakfast/brunch), macaroni and cheese and chicken nuggets for the little ones (brunch/dinner) and more grown up fare like salads, a carving station and peel and eat shrimp (brunch/dinner). A Chef Mickey’s meal ends with a trip to the dessert station. Donuts and pastries for breakfast and brunch, and cakes and make your own sundaes for dinner! I also like that at each meal there is fresh fruit available. You can check out more of the menus here. As you dine, the characters make their way around to each table. By the end of the meal, you will have had a chance to meet all five characters and take pictures! Periodically, the characters will come out to the dining room and do a little dance, getting the crowd up and dancing! With Chef Mickey’s being so easy to access, it makes a great meal to start or end your day, or one worth popping over to in the middle of the day. Prices range from $24 for a children’s breakfast/brunch to $50 for an adult dinner. Find a full review of Chef Mickey’s here. Advanced Dining Reservation Recommended: Yes, this is an extremely popular character meal. Location: Chef Mickey’s Restaurant is located in the Contemporary Resort. You can walk from Magic Kingdom, or take the monorail or Disney bus from other hotels or parks. Grand Floridian’s 1900 Park Fare is a rare restaurant that has different character meals depending on the time of day. The Supercalifragilistic Breakfast at 1900 Park Fare is a character dining experience that my whole family-even the teenagers-loves! We have dined here twice, and the character interaction is fantastic! It makes a great “non park day” breakfast, or even a fun meal to enjoy on your last day at Walt Disney World. This experience is located at 1900 Park Fare, on the main level of Disney’s Grand Floridian Resort & Spa. The menu is full of breakfast favorites-like Mickey Waffles, fruit, and cereals. They also have an omelette station, as well as other favorites like bagels, bacon, sausage, oatmeal, etc. And don’t forget the famous Strawberry Soup! 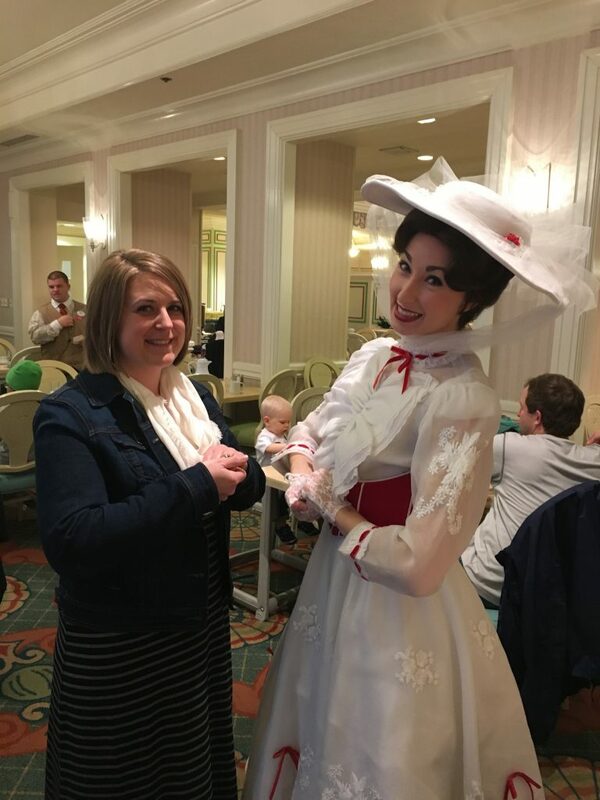 At the Supercalifragilistic Breakfast, you encounter Mary Poppins and some of her dearest friends. Tigger, Winnie the Pooh, the Mad Hatter, and Alice in Wonderland are the characters we have frequently seen at breakfast. Find a full review of the Supercalifragilistic Breakfast here. Advanced Dining Reservation Recommended: Yes. This is a fairly popular breakfast, and the only place you can dine with Alice in Wonderland, the Mad Hatter, and Mary Poppins. Characters: Mary Poppins is always there, and the rest are subject to change. However, in our experience, Tigger, Pooh, Alice, and the Mad Hatter have been there multiple times. Location: Disney’s Grand Floridian Resort & Spa. This resort is located in the Magic Kingdom area, on the monorail. 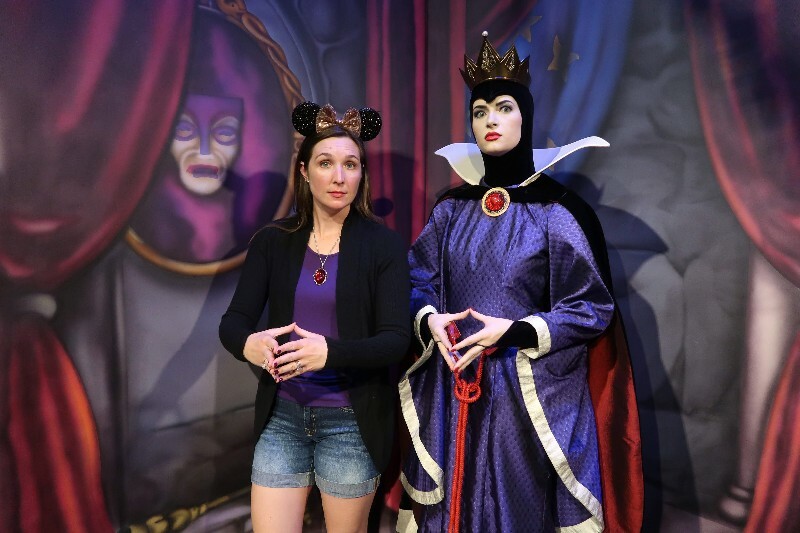 We love meeting all kinds of Disney characters, but my favorite ones are villains! Cinderella’s Happily Ever After Dinner gives you the rare opportunity to dine with a villainous group of ladies in addition to Cinderella and Prince Charming. During your meal you generally see Cinderella, Prince Charming, Lady Tremaine (Cinderella’s stepmother), Anastasia and Drizella (the ugly stepsisters), but characters are subject to change. Each character will come to your table individually which makes for some fun interactions. Prince Charming even twirled Elizabeth in a little dance before signing her autograph book. The meal at Cinderella’s Happily Ever After Dinner is an extensive buffet. There were dozens of choices from fresh carved meats, seafood, salads, pasta, traditional kid fare, and several dessert options. The chef came to our table to discuss Elizabeth’s food allergy. The chef informed us which options would be safe for her and then walked us through the dessert line to answer any questions we had about ingredients. I loved Cinderella’s Happily Ever After Dinner. The villains make it so fun to be bad and you still get to meet sweet Cinderella and Prince Charming during your meal. I think this is a good option for those looking for a chance to meet Cinderella if you can’t get reservations at Cinderella’s Royal Table or Akershus or if you love a good villain experience like I do. Find a full review of Cinderella’s Happily Ever After Dinner here. Characters: Cinderella, Prince Charming, Lady Tremaine, Anastasia and Drizella are usually in attendance. Please note characters are always subject to change. Location: This meal takes place at 1900 Park Fare on the main level of Disney’s Grand Floridian Resort. There are two character tea parties available at Disney’s Grand Floridian Resort – The Wonderland Tea Party at 1900 Park Fare and Disney’s Perfectly Princess Tea at Garden View Tea Room. The Perfectly Princess Tea party features special gifts and experiences for your princess with Sleeping Beauty as the featured princess. The Wonderland Tea Party welcomes you to have tea with characters from Alice in Wonderland. 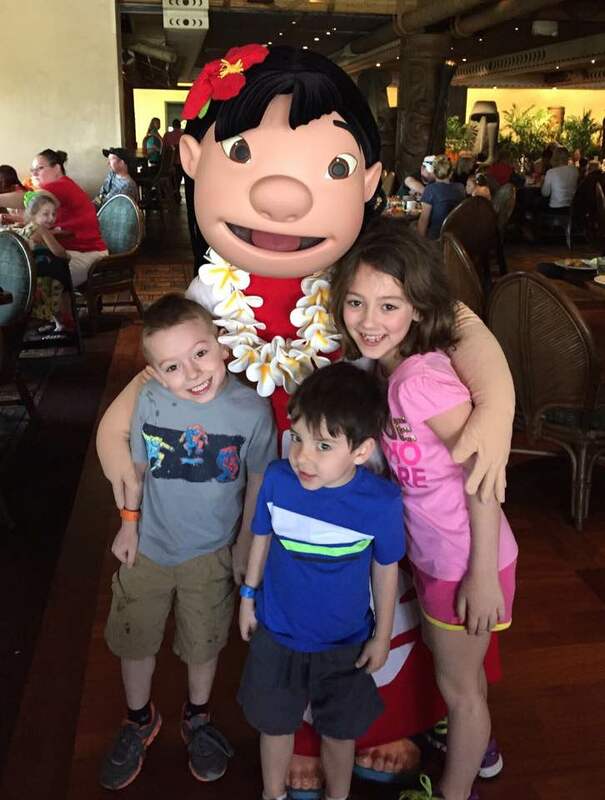 ‘Ohana is a character breakfast located at the Polynesian Resort at Walt Disney World. When you arrive, you are greeted with an Aloha and ‘Ohana. The ‘Ohana character breakfast is inspired by the Disney animated movie Lilo and Stitch. During the movie they always go back to ‘Ohana because ‘Ohana means family, and family means no one gets left behind or forgotten. This family message is one of the things I love about the ‘Ohana breakfast. One of the great things about this breakfast is that it is served family style and is unlimited. This means they will bring everything to your table and as you need more they will refill. The breakfast included eggs, sausage, fruit, Mickey and Stitch waffles, fried potatoes, pastries, and Stitch juice. The juice is unique to ‘Ohana and was a favorite by all of us! During the meal Lilo, Stitch, Mickey, and Pluto visit your table for autographs and photos. Be prepared for mischief when Stitch comes to your table. He is playful and silly, the kids and all the adults with us had a fun time with him. They also have a character parade your family can participate in that goes around the dining area. Find a full review of the ‘Ohana breakfast here. Be whisked away to the Enchanted Forest when you enter Artist Point at Disney’s Wilderness Lodge. A fun assortment of characters and an excellent meal await you in this special forest. Storybook Dining at Artist Point is a 3 course character meal. There are three shared appetizers, an individual main course, and then four shared dessert options. The appetizers and entrees are the best character meal food we have ever eaten. Dessert was fine, but a little disappointing after the amazing cocktails, appetizers, and entrees. You will usually meet four characters at Storybook Dining at Artist Point With Snow White. 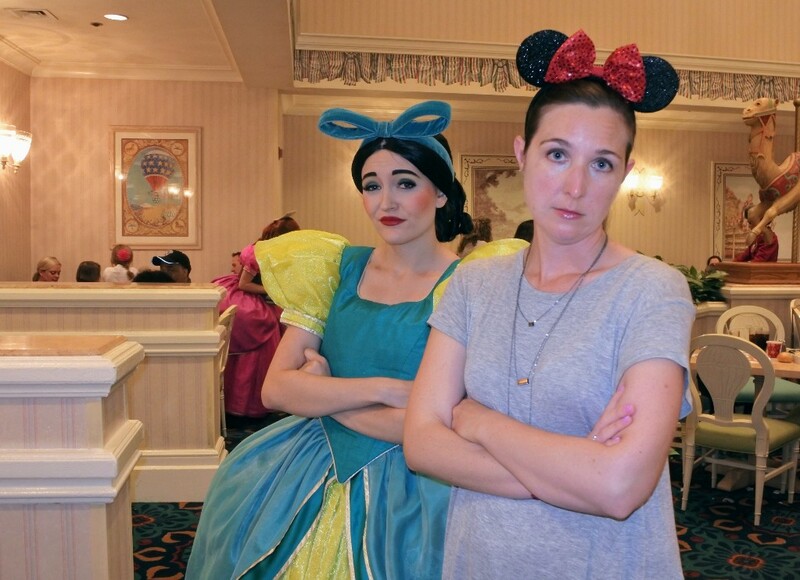 Dopey, Grumpy, and Snow White come to each table during the meal. The Queen has a separate meeting spot in the center of the restaurant. After dessert, but before leaving the restaurant you can queue up to meet The Queen and take pictures. 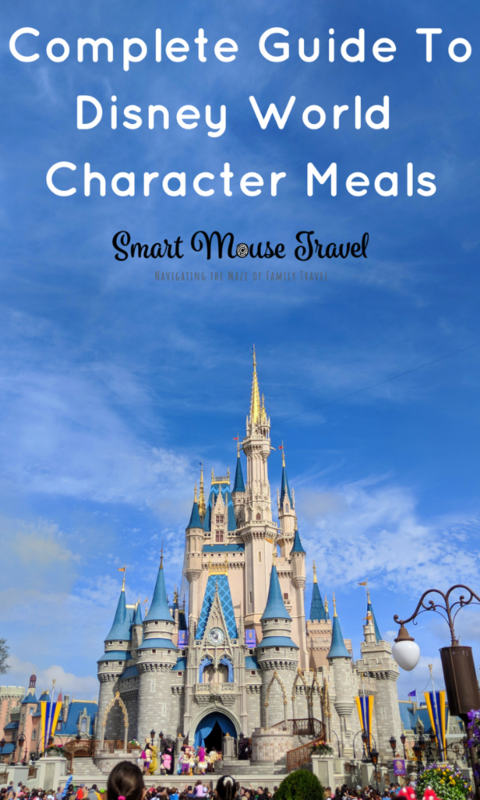 We have gone to many Disney World character meals over the years, but there are still a few on my bucket list. I will include them here to complete the list. This way you can fully evaluate all the available character meal options, even though I cannot speak from personal experience (yet!). Mickey’s Backyard BBQ takes place on Disney’s Fort Wilderness Resort grounds and features a home-style barbecue meal. Generally Mickey, Minnie, Goofy, Chip ‘n’ Dale are available during this relaxed outdoor meal with a live country and western band. Although Disney World has not officially announced that Mickey’s Backyard BBQ is closing there are no reservations available after December 31, 2018. Many people don’t know that there is a Four Seasons Resort in the Golden Oaks area of Disney World. Golden Oaks is a high-end subdivision with gorgeous homes. The Four Seasons Resort even has rooms with a view of the Magic Kingdom fireworks. 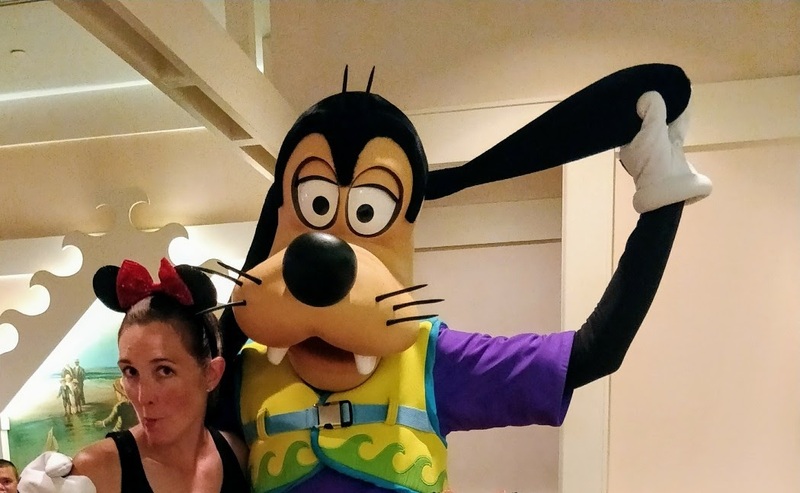 The resort hosts a breakfast on some mornings featuring Goofy and friends. Sometimes you can even see Mickey and Minnie Mouse at this breakfast, although this information is not publicized. Find out more more about Good Morning Breakfast with Goofy and His Pals. We love Disney Character meals (and I know we are not alone). 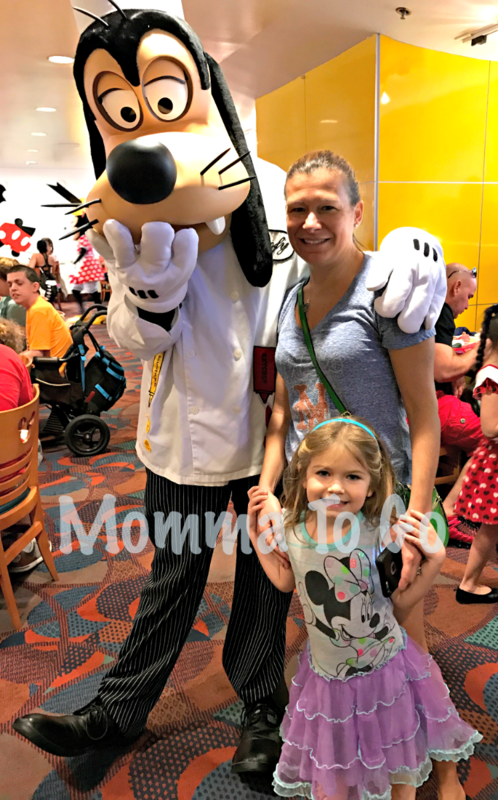 There are so many Disney World character dining options found in the Disney World theme parks and resorts that choosing the right one can be challenging. 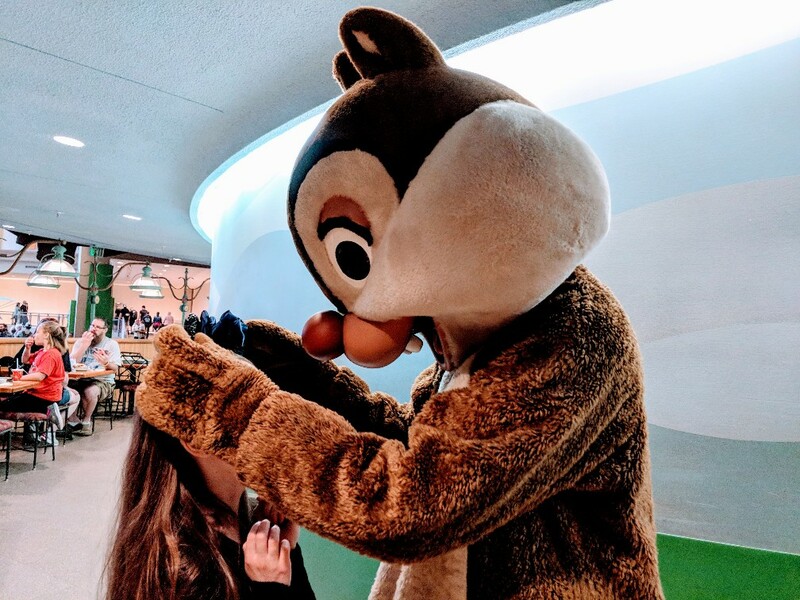 I hope that this comprehensive review of Disney World character meals helps you to find the best option for your family vacation. Just remember to make advanced dining reservations as early as possible (ideally at 180 days ahead of your vacation). And above all else have fun at your character meal no matter which one you choose! We will be trying dinner at Akershus for the first time during our spring trip. I’m feeling good about our choice after reading your review! Thanks for sharing! This list is amazing! Im so excited to be included, but now want to check out all the places on this list! So many choices and not nearly enough time for our trip in December! Our friends at A Princess and Her Pirates state that Alice and the Mad Hatter stop by often, but not always. The Disney World website says this: “Guests may meet such Disney Characters as Mary Poppins, Alice in Wonderland, the Mad Hatter, Tigger, or Winnie the Pooh. Character appearances and entertainment are subject to change”. I hope that Alice and the Mad Hatter are there for your breakfast!